Roasted sweet potatoes with cranberries is a healthy, make ahead savory side dish that’s perfect for Thanksgiving. 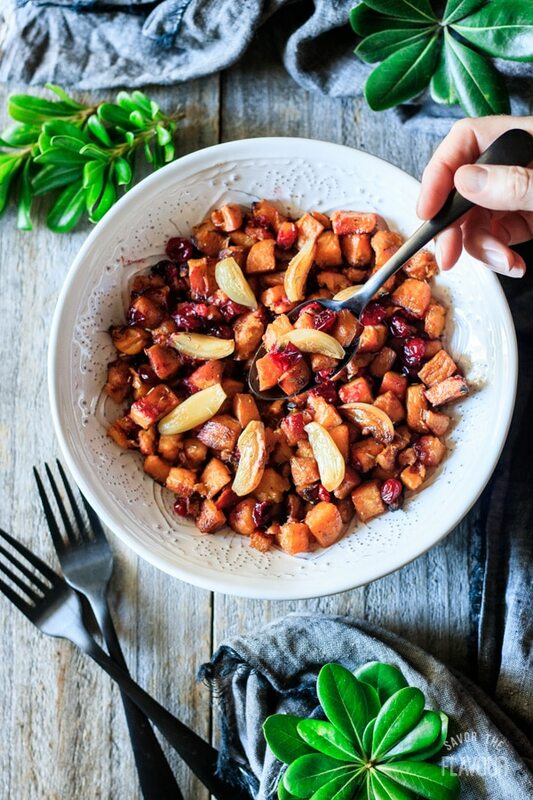 Cubed sweet potatoes are oven roasted with garlic cloves, spices, and fresh cranberries. 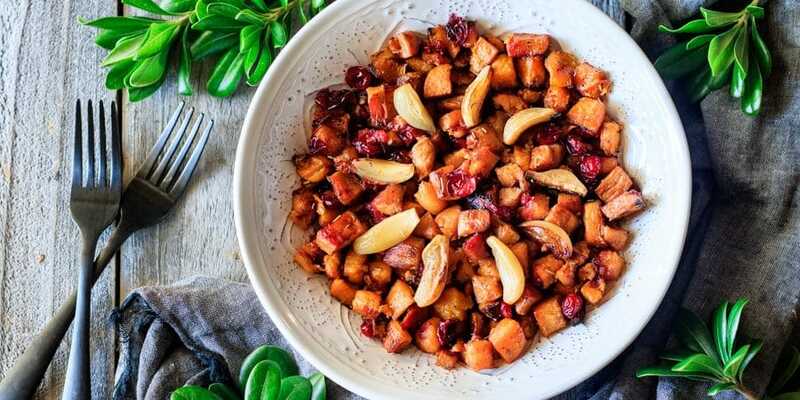 This quick and easy holiday side is sure to please! This post was originally published on October 10, 2017. 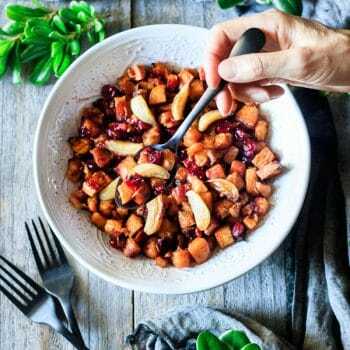 Roasted sweet potatoes with cranberries are a refreshing change from the traditional sweet potato casseroles that are loaded with sugar. This side dish has a delightful surprise of the occasional mouthful of roasted garlic. 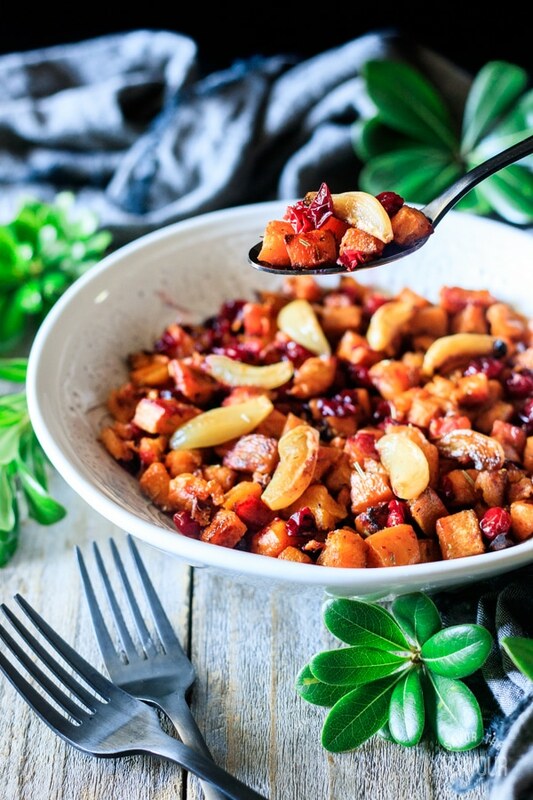 The cranberries not only add a lovely burgundy color, but also a special tartness that compliments the maple syrup on the sweet potatoes. Four spices that are traditionally used at Thanksgiving can be tasted in here: sage, thyme, rosemary, and nutmeg. 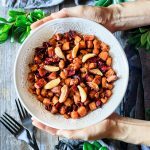 If you are looking for a new way to eat sweet potatoes, I encourage you to give this recipe a try because it’s quick and easy to make. Its savory flavors are a exciting twist that won’t disappoint. Gather the ingredients. 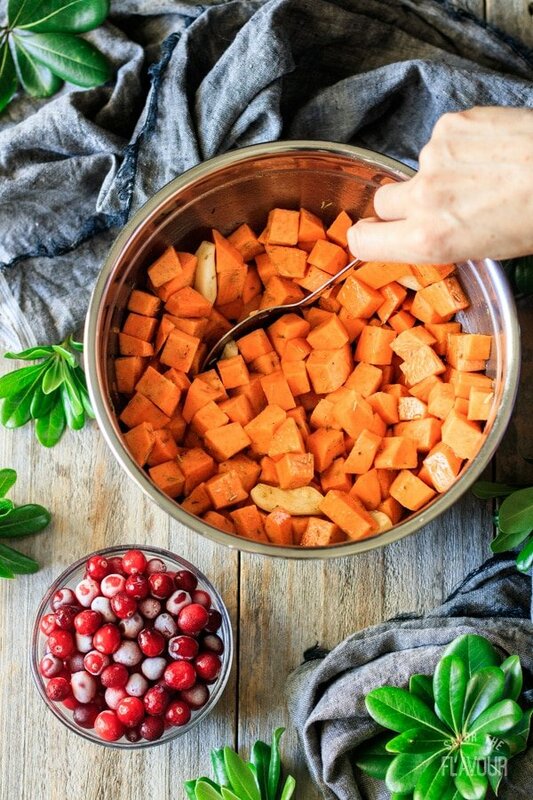 Rinse and cube the sweet potatoes and rinse the fresh or frozen cranberries. Peel the garlic cloves. 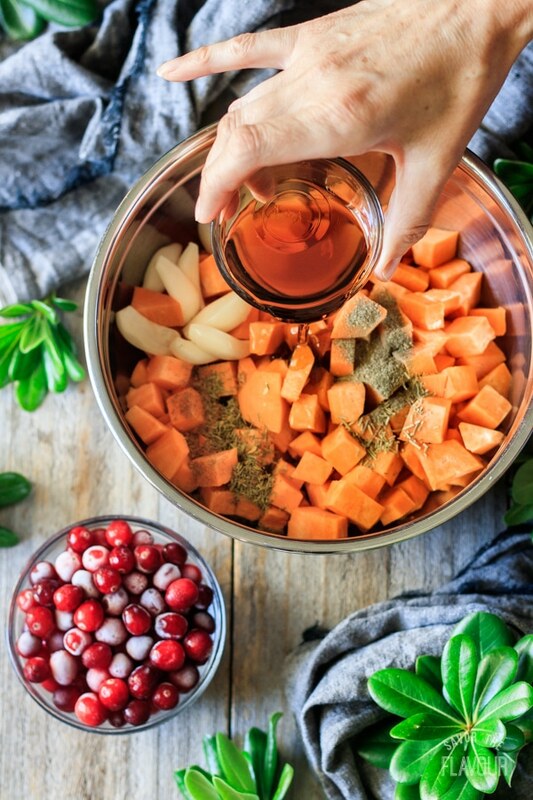 Place the cubed sweet potatoes, dried spices, garlic cloves, oil, and maple syrup in a large bowl. Save the cranberries for later. Mix together with a large spoon until every cube is well coated. 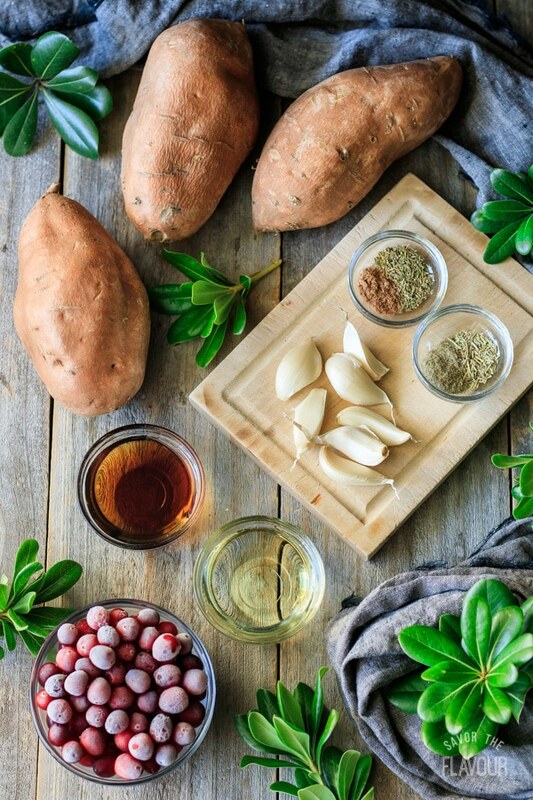 Spread out the cubed sweet potatoes and garlic cloves on a foil-lined baking sheet that has been brushed with oil. Bake for 10 minutes at 450 F. Stir to prevent burning. Rotate pan and cook for another 10 minutes. Add the cranberries and a bit more oil if necessary. Bake for the last 10 minutes. Remove from the pan and place in a bowl. Serve warm. 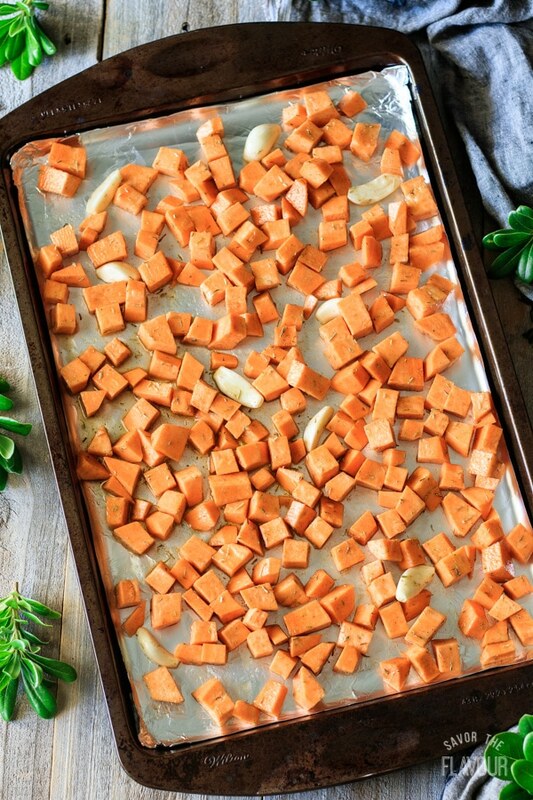 Put the cubed sweet potatoes in a single layer on the roasting tray. Don’t overcrowd. Evenly coat cubes with oil and spices to increase the flavor. Turn the cubed veggies twice in 10-minute intervals to prevent burning. Cubed sweet potatoes shrink when roasted, so cook more than you think you’ll need. Optional: drizzle with extra maple syrup or balsamic vinegar after baking. 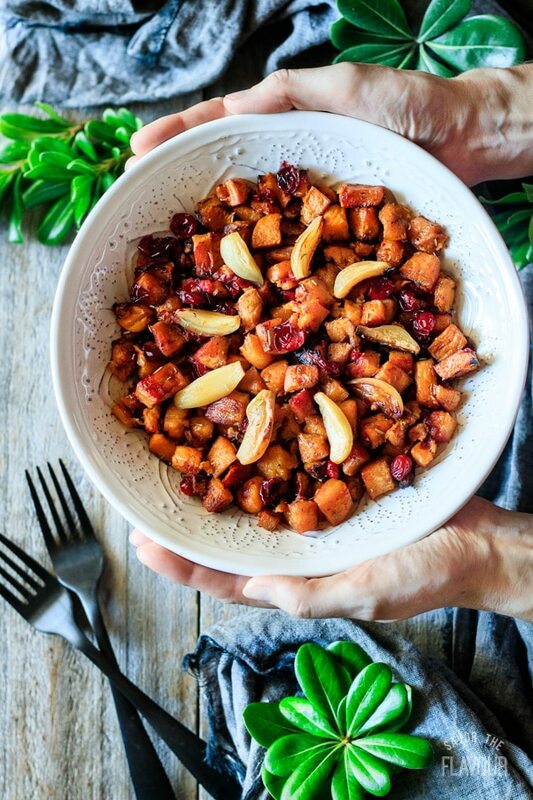 These other healthy side dishes are a lovely addition to your holiday table. How to Roast Butternut Squash: you will be an expert at cutting and roasting butternut squash with these tips. 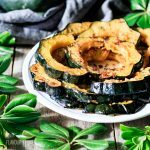 How to Cook Acorn Squash: you’ll be blown away by how tasty acorn squash is–especially with garlic butter on it! Balsamic Roasted Carrots: an easy, healthy side dish recipe that takes only 20 minutes of prep time. 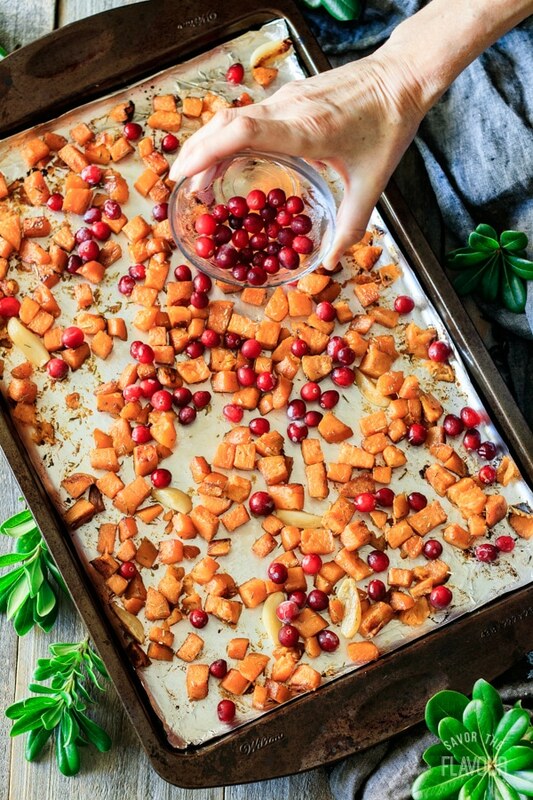 Did you make these roasted sweet potatoes with cranberries? Please leave a recipe rating below to share how you enjoyed it. Line a cookie sheet with aluminum foil. Brush with oil, and preheat the oven to 450 F.
Put all the ingredients except the cranberries in a medium bowl, and gently stir to combine. Spread evenly in the pan. Bake for 10 minutes, then stir it to prevent burning. Rotate the pan. Bake for another 10 minutes, then add the cranberries and more olive oil. Stir well. After another 10 minutes of baking, remove from the oven and serve immediately. There will be parts of the sweet potato that will be baked onto the foil. These little bitties are a delicious treat for the cook to nimble on while getting the rest of dinner ready. Yummy!